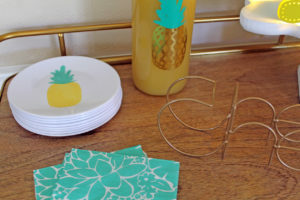 Well, that was the case when I spotted all these fun and colorful pineapple items in the dollar bins recently…yep, I couldn’t resist and loaded my cart with a “few” of these summery party supplies! The napkins! The appetizer/ dessert plates! And that beverage decanter! 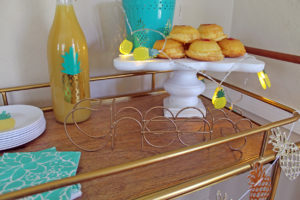 It’s all so cute and colorful that I decided to style my bar cart with it all for the summer. 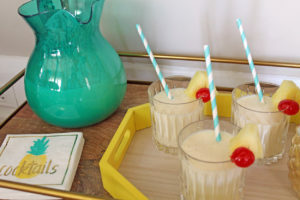 Pina coladas, anyone? 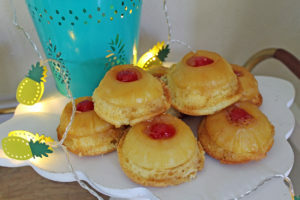 And what goes better with that than individual pineapple upside down cakes…I’m sharing the printable recipe for those at the end of the post! 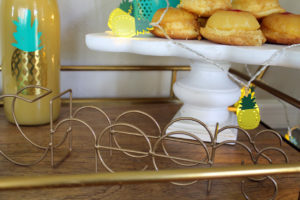 And what about that lighted pineapple garland…I think that’s my favorite part of the cart! 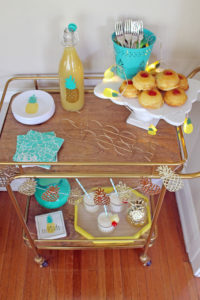 The teal and yellow color scheme just screams summer, and I intend to enjoy this bar cart setup ALL summer long! 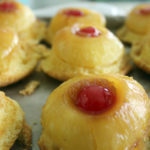 Be sure to get the recipe for those pineapple upside down cakes. They are so moist and flavorful…a refreshing treat on a hot summer day! Drain the pineapples and reserve the juice. Melt the butter in a small pot over medium heat. Add the brown sugar, and mix together. 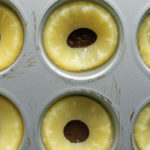 Spray the the insides of a muffin pan, and evenly divide the butter/ sugar mixture and pour into the muffin cups. 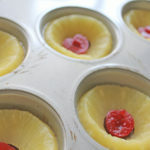 Press the pineapple slices on top of the sugar mixture. 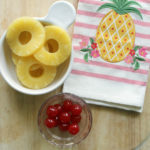 Place the cherries in the center of the pineapple, sliced side up. 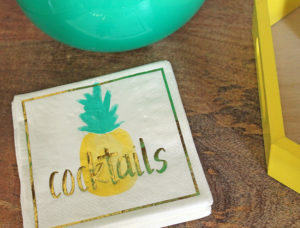 Prepare the cake mix according the package instructions, substituting the water for the reserved pineapple juice. Pour the cake batter on top of the pineapple slices. Fill 2/3 of the muffin cup. Bake at 350 degrees for 20-25 minutes, or until baked through. Cool 5 minutes. Loosen edges and invert cakes onto a cooling rack. 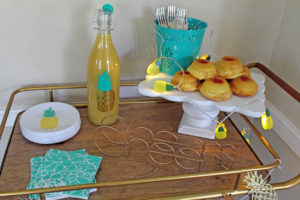 I’m loving the mini pineapple upside cakes!! They bring back so many delicious memories! My mom would make a pineapple upside down cake when we were younger in a cast iron skillet!!! Best flavors….I’m definitely going to try these!! Much easier too!! Thanks!! The cast iron recipe sounds delicious!